These are the memories that are important for us to hold on to when the summer scorches our lives. As we grasp our final winter days, we also hang onto our comfort foods like stews and warm starchy dinners. From autumn to spring, many people cannot resist the allure of comfort foods. Of course, that means something slightly different to everyone from sweet, dense desserts to hot bowls of mashed potatoes and chili. Some believe this is an animal instinct in order to survive cold weather while others opine that it’s simply an association between high calorie foods and favorite holidays. Ira Ockene, a cardiologist at the University of Massachusetts Medical School believes the tendency to overeat during winter might be basic biology. Ockene told NPR that winter eating may be a defense mechanism urging us to stockpile for cold months ahead. Other scientists argue that winter weight gain is simply a product of our environment – having nothing to do with biology. From Thanksgiving through Valentine’s Day, our calendars are filled with opportunities to celebrate with comfort foods. This coupled with a decrease in physical activity during the cold months, makes it only natural that some people gain a pound or two during winter. There is another terrific study on why we might overeat some of these wonderful foods. A study from the Canadian University of Maryland found that when love is put into something that is baked for our benefit, the consumer believes the end result is better. So, when Grandma makes fried chicken just for you, it actually tastes better because of the emotional connection that’s created between you. The more you remember the love, the more you eat. As I’ve mentioned before , we are very fortunate to have seed stewards in our community and growers of heritage grains. Bring stock to a boil in a saucepan. Add polenta and stir, reduce heat and continue to stir. It takes about 40 minutes for the corn to soften and become a creamy porridge. The polenta is ready when it pulls away from the sides of the pan but isn’t dry. Stir in parmesan and rosemary. Heat the olive oil in a large fry pan and add half the mushrooms. Fry for a few minutes until browned, not too long or the mushrooms become rubbery. Remove from pan and repeat with the other half of the mushrooms. At the end, add the garlic, tarragon, and thyme to all the cooked mushrooms. I also added some tomatoes and left over pasta sauce. When the polenta is ready pour out on a wooden cutting board and spread. Top the hot polenta with slices of taleggio and pour the herby mushrooms over the top. Slice it up and serve. What is your winter comfort food and what motivates you to eat it? yumzaaaaaaaaaaaaaaaaaaa…well, my winter comfort food would be Ramen, curried chicken and steamed rice or a hearty chicken pie. I also tend to eat a lot of sweets in winter. Again, like at yours, we also hand on to to the last shreds of winter. Soon, we’ll have to drink gallons of “nimbu pani”. Ramen is a good one. We have a favorite restaurant here that does ramen on Tuesday nights. It’s so soothing. Now tell me about nimbu pani? Ha! it’s still delicious and you can add as much cheese as you need. Send me the okra recipe! Oh, our weather is glorious and the scents that sweep through amazing; acacia blooms are my favorite but the citrus is also amazing. A fried egg sandwich is a year round comfort food for me. Eggs are the reason I can’t be vegan – well maybe not the only reason but I just love them. Potatoes, Pasta, Pizza, Bread, Soup, Grilled Cheese, etc.. FOOD = GOOD! And I love that there are now so many variations on grilled cheese. It’s come so far from when I was younger! Had anyone tried this without cheese? And what mushrooms work best? Porcini, cremini, portobello? I’m going vegan for Lent and would love to make this, with cheese on the side for my family. I actually don’t eat much dairy and love polenta without cheese. Sometimes I let it cool and then slice and rewarming in hot olive oil. Then any topping will do! What other vegan dishes are you planning for lent? I have some ideas. … roasted veggies, Indian food, lentils, chili, and lots of salads with chickpeas. Need to try some tempeh and tofu dishes. Love Asian cooking – noodles, mushrooms, seaweed. I am currently a pesco, ovo lacto vegetarian (no meat but do eat fish). Giving up cheese and seafood will be the biggest challenges. Sounds terrific. I am pushing away a number of things this year during lent – trying to lighten! There is a small place near us that sells prepared polenta and I buy it often but now, with our heritage grains, I am enjoying this even more. I just love polenta and this recipe looks marvelous! Thanks. I have lots of comfort foods. Roasted veggies, tuna noodle casserole and yes, a fried egg sandwich anytime! As someone who can get cravings for spinach and those sweet thick-walled red peppers, I have to come down on the side of people who say it’s protective for us to eat in a certain way in winter. If I’ve watched my diet too closely through fall and winter, I get massive fat cravings in late winter and need to chow down on eggs, cheese, and heavy cream. Needless to say, I try to spread those things around a little more nowadays. I love it – the chowing down on eggs, cheese and heavy cream. I in a light phase right now and hoping to ride it into summer. I agree and think that light dishes like salads are nice in warm temps. I think that last study is most accurate, food made with love is the best! That is the truth, isn’t it? Great to have a recipe for the packet of polenta that has been hanging about the cupboard for far too long! Will try it without the cheese too as we are also trying to reduce diary. Thanks as always. Oh, let me know how it turns out. Are you still in France Crystal? I think my grandmother’s homemade noodles might be my favorite comfort food. 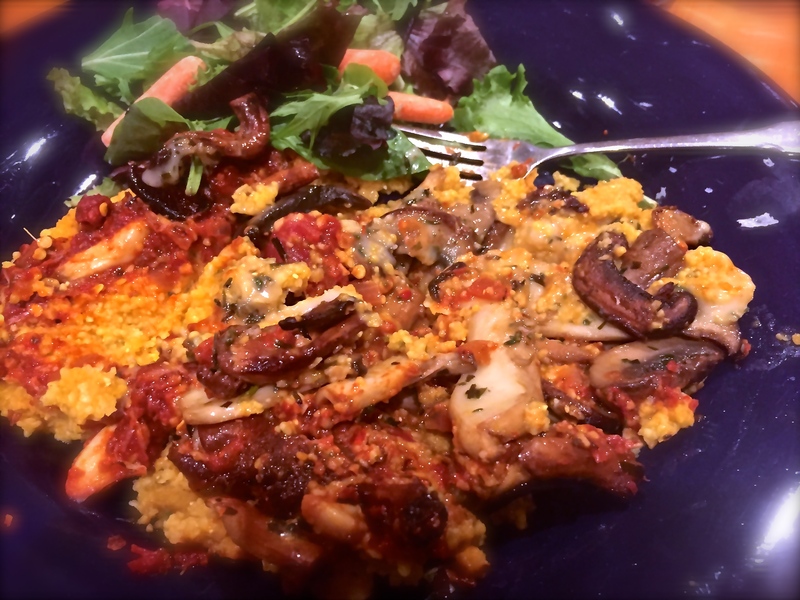 Your polenta looks good with all the veggies in there! My great grandmother used to make them with chicken and then we served it over mashed potatoes. I haven’t thought about that in years – starch upon starch, made with love, totally comforting and delicious. What great flavors you’ve mixed in here! Yum! Thanks. Do you ever eat polenta? Thanks for this nice comfortable recipe. Love polenta. My big winter splurge is always pasta. Juicy in lemon and olive oil or a rich tomato sauce but polenta right along side in equal enjoyment. I once had a slab of polenta painted with pesto, crema fresca and tomato sauce like an Italian flag. It was amazing. My husband swears he can taste food made with love vs. “no luv”. Makes pulling that supper together after work a special challenge on the nights when I didn’t plan ahead…. Luckily, he tries to be helpful most nights which fills my love tank! It’s fun to have a helper, isn’t it. Yes, this thick coarse kind is really something. I need to break my “no more cookbooks” rule and buy this one. I keep seeing so many delicious recipes from the book. It is a beautiful book Jane. I love pumpkin or chicken and corn soup for winter. It’s the texture, the taste and as you say the being made with love. My hubby makes a brilliant chicken and corn – often doing it when the family are unwell. Yum, those all sound terrific. Clearly loving and healing! Good – it worked then. Polenta is a traditional family meal, originating from the Italian part of Switzerland.The typical Winter comfort food we like so much that it comforts us in all Seasons 😉 I love your recipe and add sometimes sliced tomatoes. A kind of pizza-polenta. Thanks for sharing this delicious meal. I love polenta as a base for many things Isa and even on it’s own with butter.